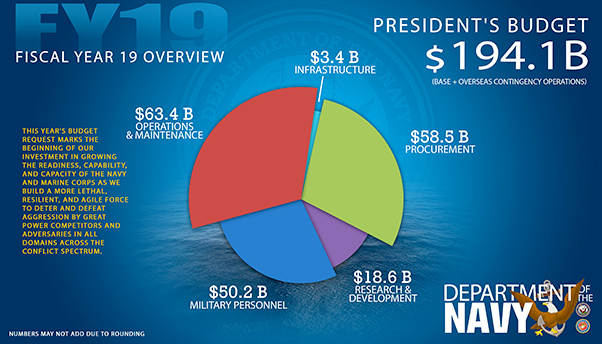 The Department of the Navy released its proposed $194.1 billion (Base and Overseas Contingency Operations) budget Feb. 12, 2018, for fiscal year 2019. This year’s budget request is focused on restoring wholeness by growing the readiness, capability and capacity of the Navy and Marine Corps in an effort to build a more lethal, resilient and agile force to deter and defeat aggression by great power competitors and adversaries in all domains across the conflict spectrum. This force is necessary to fulfill the maritime responsibilities articulated in the National Defense Strategy. The submission will build on current programs and invest in innovation to enable the Navy to compete in a fast-paced, complex global maritime environment – today and in the future. The submission includes a $58.5 billion (base and OCO) procurement budget that would buy 10 new ships and 54 ships across the Future Years Defense Plan (FYDP) and invest in high-tech systems including unmanned, cyber and directed energy weapons. The 10 new ships the budget would purchase include three Arleigh Burke-class destroyers, two Virginia-class submarines, one littoral combat ship and one expeditionary staging base to prioritize stability in major combatant shipbuilding as the fleet continues to grow. Additionally, the budget funds the construction of 120 aircraft in FY19 and 655 aircraft across the FYDP. By fully funding the Columbia-class SSBN program, the FY19 budget maintains the Navy’s commitment to providing the nation with a credible and survivable sea-based strategic deterrent. 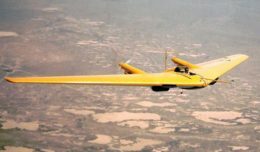 In order to meet dynamic changes in the security environment of today, this year’s submission includes $18.6 billion for research and development, supporting the Navy-Marine Corps team of the future through technological advantages designed to counter adversaries in all environments and across all spectrums. Highlights of the proposed DoD budget are outlined at http://comptroller.defense.gov/BudgetMaterials.aspx. The entire fiscal 2019 DON budget proposal may be viewed at www.finance.hq.navy.mil/fmb/PB/books.htm.